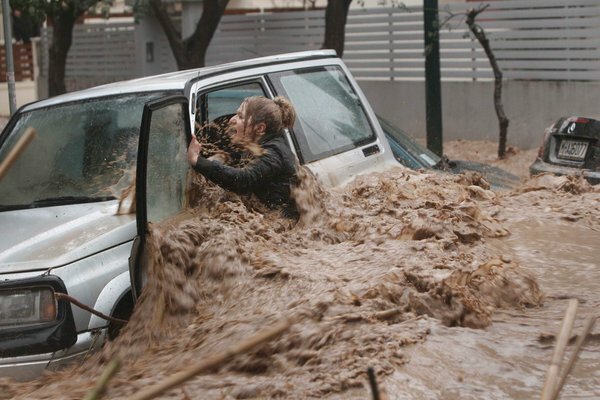 ATHENS — Torrential rain of an intensity not seen in decades flooded roads in Athens on Friday, overturning parked cars and stranding dozens of motorists, including a 28-year-old woman who died of what appeared to be a heart attack. More than six hours of solid rainfall starting at 5 a.m. flooded the streets of the capital, caused two rivers to break their banks and paralyzed public transport, causing traffic chaos as tens of thousands of Athenians sought to reach their offices during the morning rush hour. Two electricity substations were deluged, prompting power cuts, and the fire service was besieged with more than 800 calls from residents with flooded homes and 100 from motorists stuck in floodwaters. The amount of rain that fell was equal to the average rainfall for the whole month of February, meteorologists said. A woman found slumped over the wheel of her car in the northern Athens suburb of Halandri died of natural causes, according to doctors at the hospital to which she was taken by rescue workers. Greek news media reported that the woman had died of a heart attack prompted by shock. A few blocks away, residents rescued another woman from her stranded car as muddy floodwaters gushed by, overturning several parked vehicles on the same road. The rainfall also led to a freak accident at the Parliament building, where a cleaner working on the roof after the rain had stopped stepped through a glass ceiling as she tried to mop up water dripping into the main assembly hall, where lawmakers were to gather for a debate. The woman, who had been wearing a harness, according to parliamentary officials, was left dangling several yards above the deputies’ benches for a few minutes, until a police officer came to her aid. In another unusual incident, a derelict building in the run-down central district of Aghios Panteleimonas collapsed, apparently because of the force of the sustained downpour. No one was injured after the collapse in the busy neighborhood, one of the poorest and most densely populated in the city center. 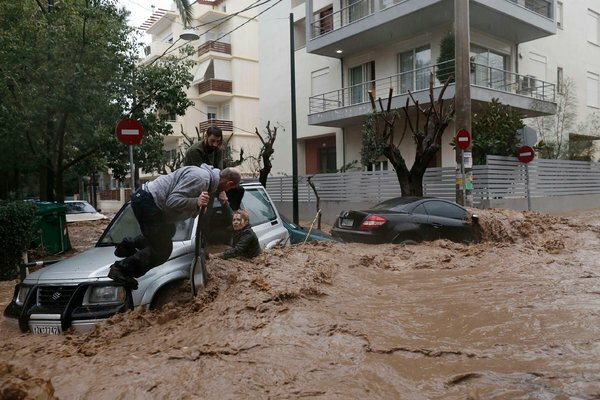 Although heavy rain is not unusual during Greece’s brief winter season, an antiquated drainage system in the capital means that streets often remain waterlogged for hours after storms. The scale of Friday’s downpour was unusual, however, with meteorologists referring to the heaviest rainfall in 50 to 60 years in comments on state television. The Greek government, which is struggling to keep the debt-racked country afloat with billions of euros in rescue loans from foreign creditors, was not able to provide an assessment of the cost of the damage caused to homes, businesses, cars and roads.